This could be due to an insecure password used by the company or the scammers got one of the employees to answer a phishing email which discloses the user name and passwords of the site. Both parties agree to terms, which include a description of the vehicle, sale price and number of days granted for the Buyer's inspection. 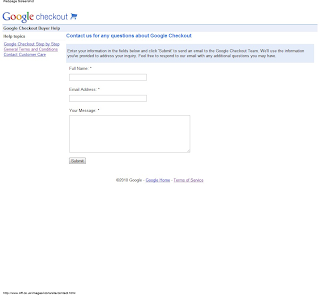 The Buyer submits their payment to Google Checkout. Once received, the payment will be verified and secured into a non-interest bearing trust account. Upon payment verification, the Seller is authorized to ship the vehicle and submit tracking information. 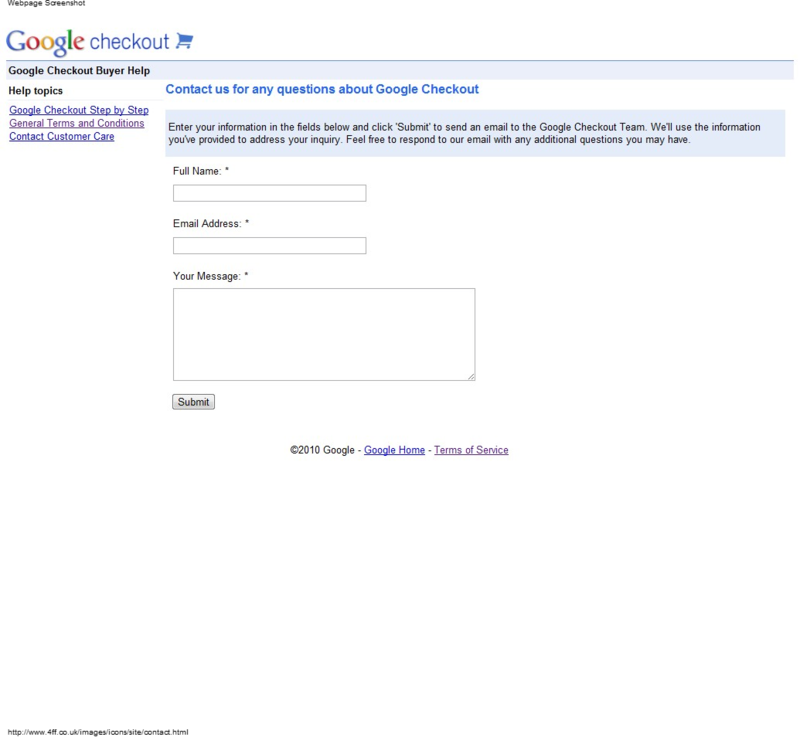 Google Checkout verifies that the Buyer receives the shipment. The Buyer has an inspection period and the option to accept or reject the vehicle. For more information, read our General Terms and Conditions Page. The transactions performed by a Buyer and a Seller on the Google Checkout site shall be governed by the Uniform Electronic Transactions Act (Civil Code Section 1633 et. seq.) governing Escrow Regulations. 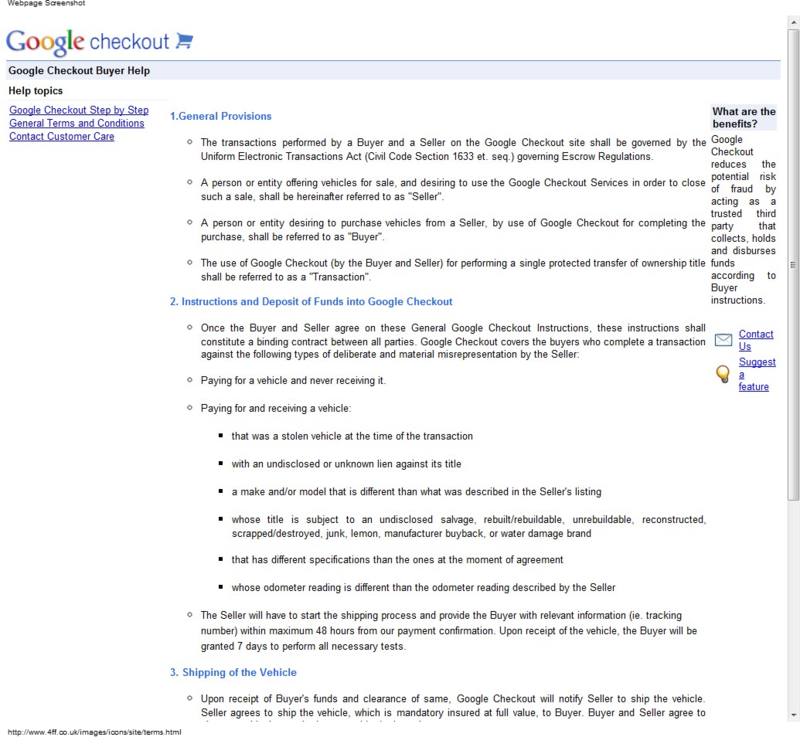 A person or entity offering vehicles for sale, and desiring to use the Google Checkout Services in order to close such a sale, shall be hereinafter referred to as "Seller". 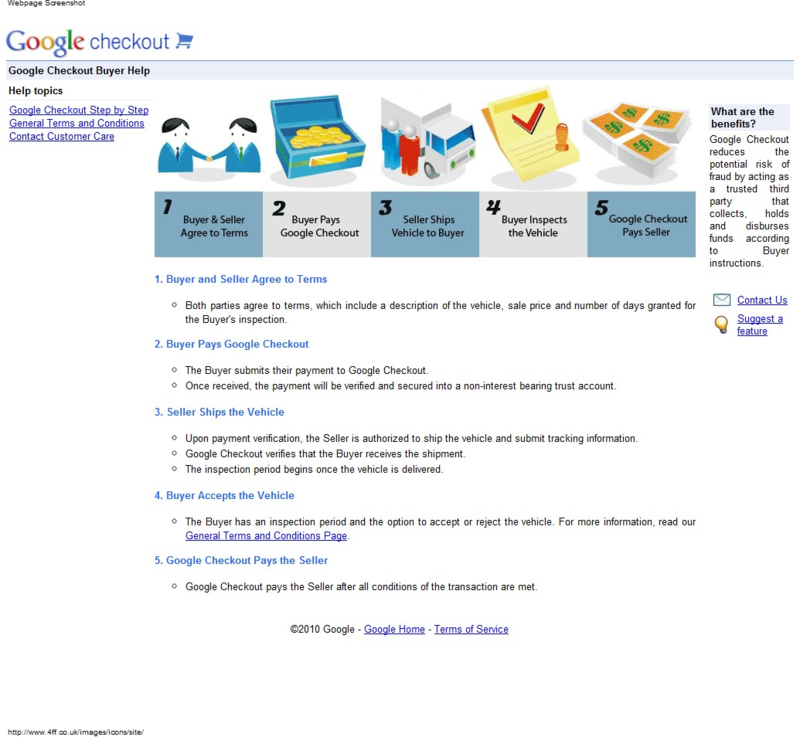 A person or entity desiring to purchase vehicles from a Seller, by use of Google Checkout for completing the purchase, shall be referred to as "Buyer". 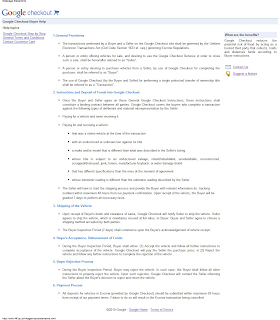 The use of Google Checkout (by the Buyer and Seller) for performing a single protected transfer of ownership title shall be referred to as a "Transaction". Paying for a vehicle and never receiving it. The Seller will have to start the shipping process and provide the Buyer with relevant information (ie. tracking number) within maximum 48 hours from our payment confirmation. Upon receipt of the vehicle, the Buyer will be granted 7 days to perform all necessary tests. 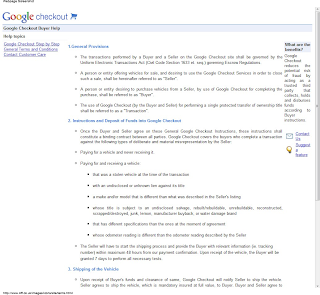 Upon receipt of Buyer's funds and clearance of same, Google Checkout will notify Seller to ship the vehicle. Seller agrees to ship the vehicle, which is mandatory insured at full value, to Buyer. Buyer and Seller agree to choose a shipping method accepted by both parties. The Buyer Inspection Period (7 days) shall commence upon the Buyer's acknowledgement of vehicle receipt. During the Buyer Inspection Period, Buyer shall either: (1) Accept the vehicle and follow all further instructions to complete acceptance of the vehicle. 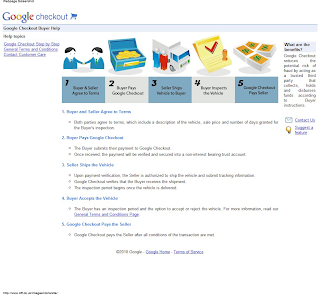 Google Checkout will pay the Seller the purchase price; or (2) Reject the vehicle and follow any further instructions to complete the rejection of the vehicle. During the Buyer Inspection Period, Buyer may reject the vehicle. In such case, the Buyer shall follow all other instructions to properly reject the vehicle. 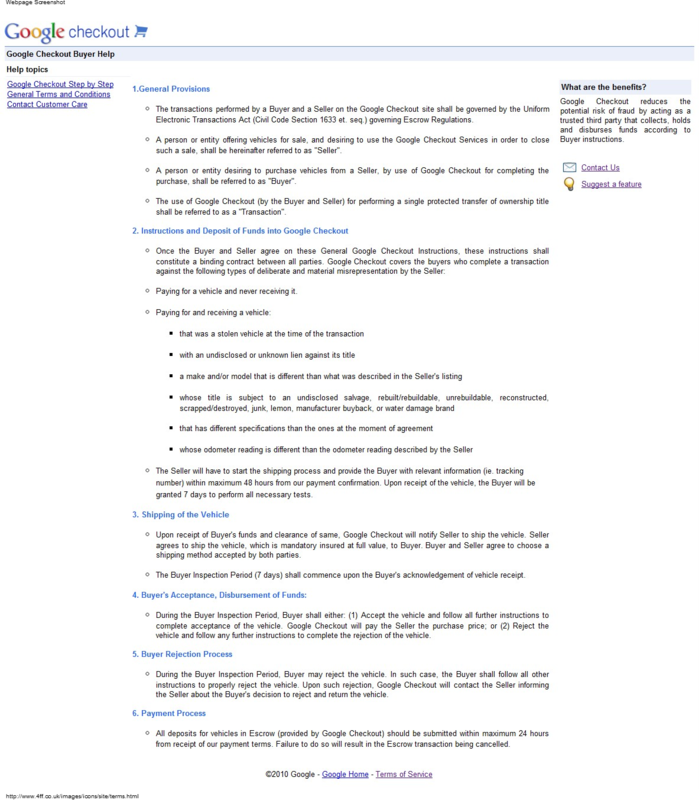 Upon such rejection, Google Checkout will contact the Seller informing the Seller about the Buyer's decision to reject and return the vehicle. All deposits for vehicles in Escrow (provided by Google Checkout) should be submitted within maximum 24 hours from receipt of our payment terms. Failure to do so will result in the Escrow transaction being cancelled.